I built the workbench in the picture in the late 1980's. It serves me well and I have very few complaints. The design is basically the Frank Klausz bench that is detailed in Scott Landis' landmark The Workbench Book. The major changes I made were making it left-handed, and using a quick release vise as the front vise. 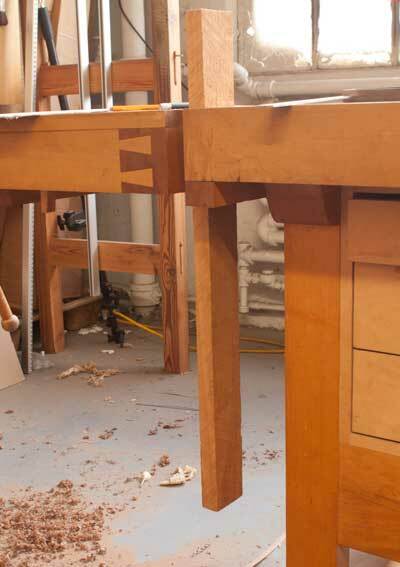 In the past few years there has been an explosion in workbench design and fitting. 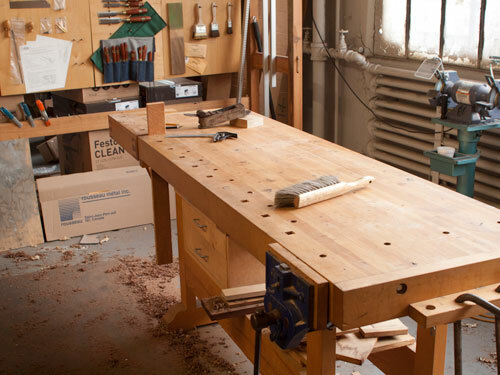 However most modern workbenches don't use a traditional tail vise, they usually use some version of a face vise just at the end of the workbench, or some sort of wagon vise. Lee Valley just introduced a mini-wagon vise. While these approaches allow you to clamp lots of long things and are reasonably versatile I don't think they are nearly as useful as a traditional "L" shaped shoulder or tail vise. (Lee valley also has some funky quick-release tail vise hardware). The main reason why a traditional tail vise is so darn useful is because of the unobstructed gap you get in the front of your bench. this gives you the perfect way to solidly clamp chair legs, or any long part that needs to be held while you work on it from one end. You also have space on both sides of the work for tools. In my case the tail vise also has dog holes so I can easily clamp boards over seven feet long, longer than my bench, and have them supported all along the underside, except for a small gap. With a end mounted face vise you just don't get that kind of support. Wagon vises do give you that kind of support but without allowing you to extend the clamping length past the length of the bench. Another use for a tail vise is something I saw recently and adopted immediately. In Tage Frid's video he saws his blind dovetail tails by holding them diagonally in the tail vise. I tried this and it means I don't have to crouch and saw up, and I can see both the inside face and the end grain as I am sawing. My tail vise was made completely out of wood, the mechanism isn't perfect - but it works well enough. In fact when it comes to real work I use it a lot more than my face vise. I have nothing against wagon vises and their descendants, I think they are a great retrofit to a bench, are very useful, easy to build, and just have the limitations I mentioned above. I do have it in for the double screw vise mounted at the end of the bench. In my opinion it's definitely at the bottom of the heap of vises. I understand why a double screw vise can be handy on the face of the bench - for clamping boards for dovetails and things like that but even so any regular double screw vise is a little low for fine work. Additionally the light is wrong at the ends of a workbench for fine work. A Bench on Bench in any of its forms is far more useful and is at the right height. For regular clamping of long boards all a double screw vise at the end of the bench does it give you two threads that can bind and if a piece of wood or wide panel is not going to move around the bench with a single threaded vise, two threads don't add anything. As for gluing up big panels and things - well that's why bar clamps were invented. Gluing up in a vise is a shortcut I have been guilty of but for a wide panel bar clamps are a much better solution than an end mounted twin thread vise. PS - I apologize for the poor quality of the photos - they really should be from the order side of the bench and show me actually doing something useful. That would entail moving the bench for the photo and setting up a real project. However in my defense I have a bad cold, and we are running around in the holiday rush. Joel - I agree. If you do any small work, odd work or toolmaking work, they are infinitely more useful. There are plenty of other ways to secure work to the surface of a bench without using a wagon vise. The wagon vises are nice, but they would be even nicer if they were a third of the way up the bench and had a detachable wheel that faced out of the front of the bench perpendicular to the travel of the vise. My bench is very similar, but my complaint is that my vice does sag and I have to remember to tighten the mounting screws often. You've got me wanting to see more photos of your work space. I see your grinder out there, near the window. Where do you keep your stones? Joel this is interesting, with the rage of twinscrew vise and wagon vise, I find that a "thrue" tail vise make a lot of sens! Can you show us more oof the mecanisim of your tail vise, I like the idea of all wood, that said, I allways hear that tail vises sag a lot!?!? Do you have or had any problems with yours? From talking to a lot of people, I've come to the conclusion that making a traditional bench is viewed as difficult and the wagon vises or twin screw end vises are, like round bench dogs, easier. The numerous times I've found myself having to work on benches lacking traditional tail vises with the square bench dogs I've felt incredibly handicapped by the limitations of those benches. I find that I rarely use my traditional "L" shaped tail vise - though I have missused it from time to time. I did add a Leg vise to my last bench which has proven to be my favorite. For the most part, I think most serious woodworkers assume traditional means solid/proven/great and most novice woodworkers assume tradional means before electricity and want every new gadget out there. Lee Valley knows how to market to the later more so than the former. Finally...someone is sticking up for at least one aspect of the traditional European bench. With the recent infatuation with Roubo and Nicholson, one would have thought that woodworking bench development came to a standstill in the late 1700s. Nice to see another left handed bench. Nicely done too. I have an end vise styled on Michael Fortune's (straight, not L shaped). For what I've been making, tables, boxes, bed, etc., I find I rarely need a face vice and haven't reinstalled mine (quick release) since I moved it last (about 15 yrs now). Curious about what the perceived benefits/ advantages of the L style. I also have my Uncles's bench. It is based on Tage Frid's and is the L shape. It doesn't appear to any more rigid. It is right handed so I don't use it but they are of a comparable age. so what is the L part of the tail vise for? On a traditional tail vise it's not really an "L", it's a frame but part of it is under the bench top. One side of that rectangular frame is the top of the vise and it provides resistance to racking. It's actually a pretty rigid and strong structure. I'm afraid I can't comment on the tail vise because, like many others I slapped a quick release on the tail and live with all of the many weaknesses it presents(which is to say that I don't use it very much). However, I find that--dare I say the current fad--for Roubo or twin screw face vises--doesn't make a lot of sense to me. They're too low for most dovetailing and too slow for most day to day clamping. The bench on bench makes so much more sense for dovetailing. Combined with a quick release front vise it offers great front vise functionality. I can't argue that! I've an old Ulmia bench, replete with tail vise. The tail vise is used frequently, even more so than the face vise. I faced it years ago with what we used to call masonite. When the face gets scored, it gets sanded smooth. When it gets worn out, it gets replaced. These old style end vises make sense for their simplicity and usefulness. Finally, a photo explaining how these things actually work. Thanks Joel!! Just one question though. The guide that runs parallel to the screw obviously braces the one leg of the vise. I've seen others without this brace and assume the mechanism uses metal plates to keep the vise from racking. I'm wondering just how far toward the screw that guide can be placed to gain some clear space on the end without losing too much strength and risk racking the vise should it be tightened down too much.